Steve Kasica is a graduate student in Computer Science and joins the UBC Infovis group. Steve previously worked as a professional research assistant in the National Oceanic and Atmospheric Administration's (NOAA) Earth Systems Research Laboratory in Boulder, Colorado. At the BELIV Workshop, Anamaria Crisan and Madison Elliott will present the paper "How to evaluate an evaluation study? Comparing and contrasting practices in vis with those of other disciplines". Michael Oppermann will give a talk entitled "Uncovering Spatiotemporal Dynamics from Non-Trajectory Data" at the Urban Data Visualization Workshop. Tamara Munzner will participate in a panel at the VisGuides Workshop. We're co-hosting the (North) West Coast Party, on Thursday night. Takayuki Itoh from Ochanomizu University, Japan, was visiting our group between Jul - Aug 2018. Thanks for your visit, it was great having you here! by Jan Pilzer, Shareen Mahmud, Vanessa Putnam, and Tamara Munzner was accepted to ETVIS 2018. Congratulations to Kimberly Dextras-Romagnino on earning your Masters degree. 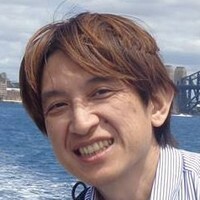 We wish you all the best in your new job at Kabam. The panel was organized by Vis X Vision to inspire cross-disciplinary perspectives for innovative, applicable, and fundable research at the intersection of visualization and vision science! 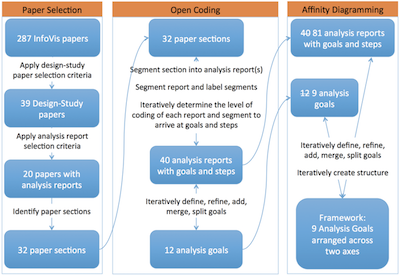 At IEEE Vis 2017, Heidi Lam presents the paper Bridging From Goals to Tasks with Design Study Analysis Reports [Honorable Mention], and Matthew Brehmer presents the paper Timelines Revisited: A Design Space and Considerations for Expressive Storytelling. Tamara Munzner speaks at the panel Reflection on Reflection in Design Studies, and offers her tutorial on Visualization Analysis and Design. 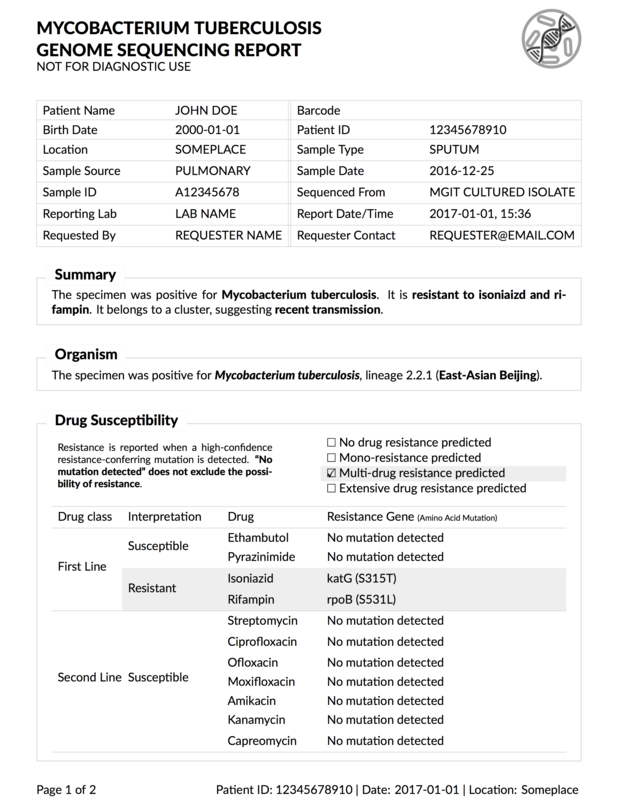 Anamaria Crisan presents an InfoVis poster: Showcasing design study methodology through simpler design challenges: An application to a microbial genomics clinical report design. We're co-hosting the Utah + West Coast Party, on Tuesday night. 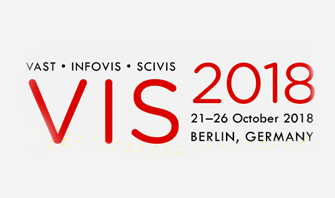 by Anamaria Crisan, Geoff McKee, Tamara Munzner, and Jennifer L. Gardy will be presented as an infovis posters by Anamaria at VIS 2017 in Phoenix, Arizona. 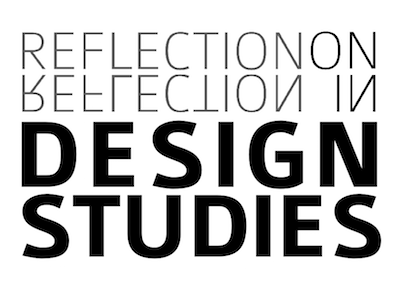 This year at IEEE VIS 17, Tamara Munzner speaks at the panel Reflection on Reflection in Design Studies, Oct 5 @ 4:15 PM. Other speakers on the panel are Jason Dykes, Miriah Meyer, Heidi Lam, Nathalie Henry Riche, Remco Chang, and Petra Isenberg. Congratulations to Dylan Dong on earning your Masters degree. We wish you all the best in your new job at The Sky Guys in Toronto. 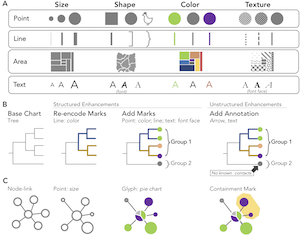 by Heidi Lam, Melanie Tory, and Tamara Munzner was awarded a Best Paper Honorable Mention at InfoVis 2017, and will be published in the special issue of IEEE Transactions on Visualization and Computer Graphics (TVCG). It will be presented at VIS 2017 in Phoenix, Arizona. Michael Oppermann joins the UBC Infovis group as a new PhD student. He previously earned a Dipl-Ing at the University of Vienna VDA group with Michael Sedlmair and Torsten Möller. Many members of the infovis reading group at a farewell dinner for visiting graduate student Georges Hattab, who returns to Bielefeld. At BELIV 2016, Ana Crisan presents a paper On Regulatory and Organizational Constraints in Visualization Design and Evaluation and Tamara Munzner speaks at the panel On the Future of Evaluation and BELIV. Tamara also speaks on the VIS panel Pathways for Theoretical Advances in Visualization, and offers her tutorial on Visualization Analysis and Design. We're co-hosting the 6th annual West Coast Party. 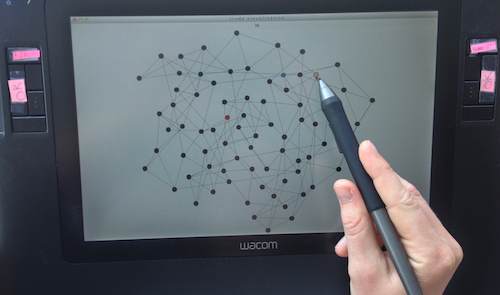 by Matthew Brehmer, Bongshin Lee, Benjamin Bach, Nathalie Henry Riche, and Tamara Munzner was accepted to IEEE Transactions on Visualization and Computer Graphics (TVCG). Matthew will present this paper at VIS 2017 in Phoenix, Arizona. Tamara Munzner's keynote talk, Visualization and Journalism: Four Vignettes, at Computation + Journalism, Sep 30 - Oct 1 2016 at Stanford. Tamara Munzner gave a keynote talk entitled Visualization Analysis and Design at Information+, June 16 - 18, 2016 in Vancouver BC, Canada. Also at Information+, recent group alum Johanna Fulda gave a lightning talk entitled What’s up with Data Journalism in Canada? and visiting PhD student Georges Hattab gave a lightning talk on A Mnemonic Card Game for your Amino Acids, which also appeared in the Information+ Exhibition at Emily Carr University of Art + Design. Tamara Munzner gave her Visualization Analysis and Design talk at Graphics Interface (GI) 2016, June 1 - 3, 2016, in Victoria BC, Canada. 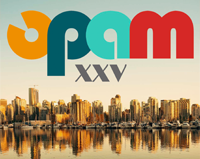 PaperQuest: A Visualization Tool to Support Literature Review, a poster by Antoine Ponsard, Francisco "Pax" Escalona, and Tamara Munzner was accepted at ACM CHI 2016, May 7 - 12, 2016, in San Jose CA, USA. Tamara Munzner gave a keynote talk entitled Visualization Analysis and Design at IEEE PacificVis 2016, April 19 - 22, 2016, in Taipei, Taiwan. Matthew Brehmer successfully defended his PhD dissertation. Matthew Brehmer attended a Dagstuhl seminar on Data-Driven Storytelling between February 7th and 12th along with a great group of researchers, designers, and journalists. A book on data-driven storytelling, written collaboratively by the seminar participants, is forthcoming. Jon Schwabish talks with Tamara Munzner, Marti Hearst (University of California, Berkeley), Eytan Adar (University of Michigan), and Robert Kosara (Tableau Software) about best practices, ideas, experiences, and different approaches to teaching data visualization. Students at the UBC School of Journalism gained hands-on experience of data visualization in a new elective offered for the first time this year by Tamara Munzner. In this course, students developed fundamental data visualization concepts and skills, including wrangling, interpreting and presenting data in a journalistic context. 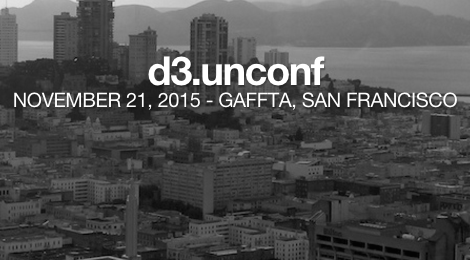 Tamara Munzner gave the Opening Keynote at the D3 Unconference, a one-day gathering of data visualization practitioners in San Francisco, CA. 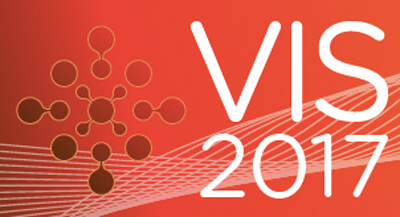 Enrico Bertini recaps the IEEE VIS'15 conference with Robert Kosara and UBC InfoVis alum Johanna Fulda in the bi-weekly podcast on data visualization. The award is given in recognition of her foundational research that has 'produced a scientific basis for principles and design choices for visualization', which culminated in her 2014 book Visualization Analysis and Design from CRC Press. This year at VIS15, Tamara was the recipient of the 2015 IEEE VGTC Visualization Techical Achievement Award. Tamara also offered her Visualization Analysis and Design Tutorial and participated in the panel entitled: "Vis, The Next Generation: Teaching Across the Researcher-Practitioner Gap". She also spoke at the VIS16 Kickoff event. Meanwhile, Matthew Brehmer presented an InfoVis paper, Johanna Fulda presented a VAST paper, and Mike Wu presented an InfoVis poster. 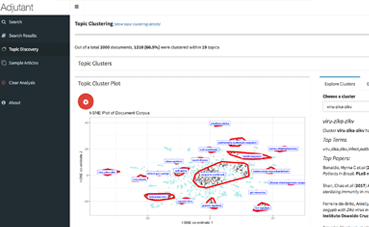 /r/DataIsBeautiful hosted Tamara Munzner for an AMA on Wednesday, August 26.
by Mike Wu and Tamara Munzner was accepted to IEEE InfoVis 2015. Mike presented this poster at the IEEE VIS Conference in Chicago between October 27th and 30th, 2015.
by Matthew Brehmer, Jocelyn Ng, Kevin Tate, and Tamara Munzner was accepted to IEEE InfoVis 2015. Matthew presented this paper in the Design Studies and Methodology session of IEEE InfoVis in Chicago on Wednesday, October 28th, 2015.
by Johanna Fulda, Matthew Brehmer, and Tamara Munzner was accepted to IEEE VAST (TVCG track) 2015. Johanna presented this paper in the Visual Analytics of Textual Data (II) session of IEEE VAST in Chicago on Friday, October 30th, 2015. Johanna Fulda presented TimeLineCurator at a Vancouver Hacks/Hackers Meetup. Tamara Munzner taught a Data Visualization Masterclass along with Gaël McGill, Sean O'Donoghue, Julian Heinrich, and Christian Stolte on June 8th at the University of Sydney. This event was part of the Vivid Sydney Light, Music, and Ideas festival. by Benjamin Renoust (National Institute of Informatics, Tokyo), Guy Melançon (Université de Bordeaux), and Tamara Munzner was presented by Benjamin at EuroVis 2015 on May 28 in Cagliari, Italy. Matthew Brehmer spoke at a Vancouver Data Visualization Meetup on "The Future of Data and Design … In Visualization Research". 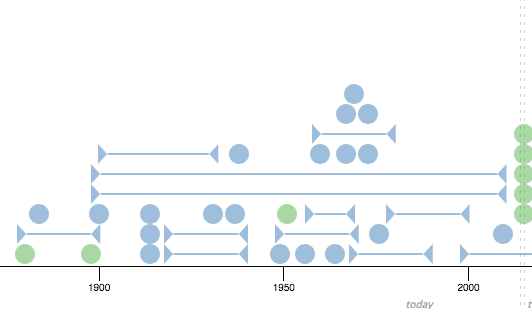 We released a browser-based visualization tool for curating timelines generated from freeform text. Try it out and let us know what you think! Tamara Munzner spoke on Visualization Analysis and Design at Tableau Software 2/20, and Microsoft Research 2/19. Her seminar at City University London's giCentre was on Feb 3. Enrico Bertini and Moritz Stefaner interview Tamara Munzner in their bi-weekly podcast on data visualization. Hosted by UBC, University of Washington, Trifacta, and CRC Press. 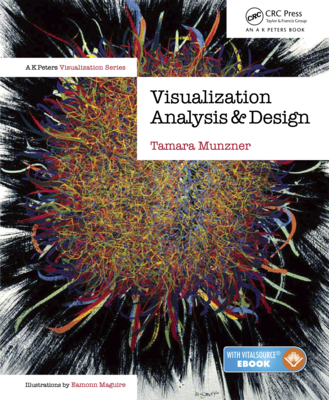 This year’s party served as the launch and book signing for Tamara’s new book Visualization Analysis and Design. It’s the the first book in the AK Peters Visualization Series (CRC Press). 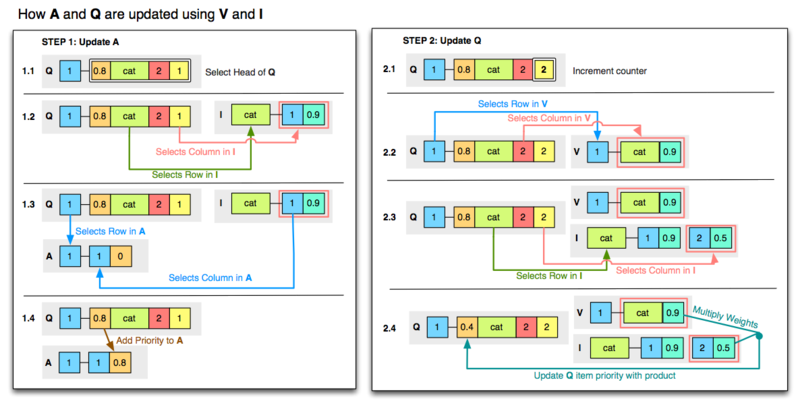 Tamara Munzner presented this tutorial at VIS 2014 on Nov. 9.
by Matthew Brehmer, Stephen Ingram, Jonathan Stray (Columbia Journalism School, Associated Press), and Tamara Munzner was presented at IEEE InfoVis 2014, November 9-13 in Paris, France. Matthew presented this paper in the InfoVis session on Documents, Search & Images on Nov. 14.
by Matthew Brehmer, Michael Sedlmair (University of Vienna), Stephen Ingram, and Tamara Munzner was presented at the ACM Workshop on BEyond time and errors: novel evaLuation methods for Information Visualization (BELIV). Matthew presented this paper in the BELIV session on Rethinking Evaluation Level: Abstracted Task vs In Situ Evaluation on Nov. 10.
by Matthew Brehmer, Sheelagh Carpendale (University of Calgary), Bongshin Lee (Microsoft Research), and Melanie Tory (University of Victoria) was presented at the ACM Workshop on BEyond time and errors: novel evaLuation methods for Information Visualization (BELIV). Matthew presented this paper in the BELIV session on Experience Reports on Nov. 10. 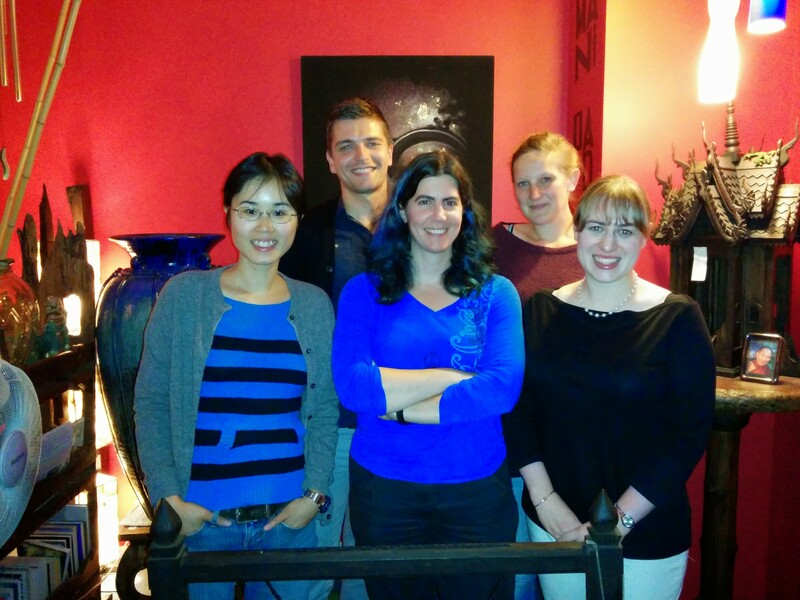 Matthew Brehmer participated in the 2014 IEEE VIS Doctoral Colloquium. Matthew spoke at the DC on Nov. 8 and presented his DC poster on Nov. 12. Tamara Munzner chatted with Lee Wilkinson and John Stasko, moderated by Eric Kavanagh, in a Google Hangout On Air on Wed Oct 1.
by Jessica Dawson, Joanna McGrenere, and Tamara Munzner was accepted to the Journal of Information Visualization. Photo from retreat rebooting the group post-sabbatical. 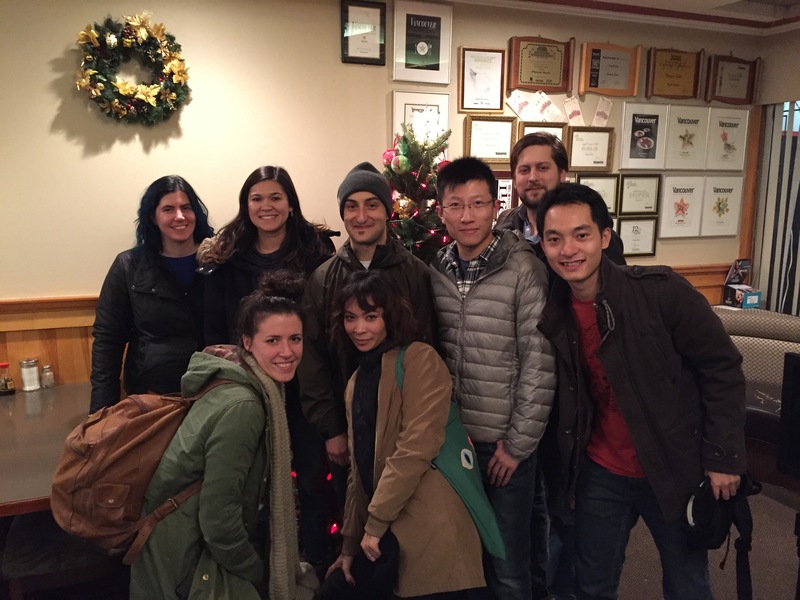 Welcome to new members Johanna Fulda and Michelle Borkin; welcome back alumna Heidi Lam who will begin new collaborations from within Google; Matt Brehmer continues. Tamara Munzner spoke at HOPE X: Hackers On Planet Earth on Jul 19 in New York City, USA. 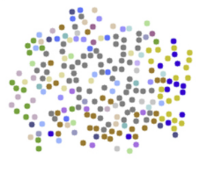 by Stephen Ingram and Tamara Munzner was accepted to the Journal of Neurocomputing's special issue on Visual Analytics using Multidimensional Projections, to appear in 2014. Tamara Munzner gave the keynote talk at the 4th Symposium on Biological Data Visualization (BioVis) on July 11th in Boston, USA. Matthew Brehmer attended the VACCINE Evaluation of Visual Analytics Workshop on May 20th and 21st at UCSD in La Jolla, USA. 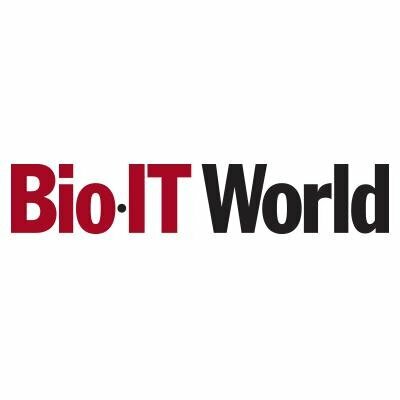 Tamara Munzner spoke at the BioIT World Conference and Expo (Data Visualization and Exploration Tools Track) on April 29th in Boston, USA. Tamara Munzner gave an invited talk at the SIAM Data Mining Workshop on Exploratory Data Analysis on April 26th in Philadelphia, USA. by Miriah Meyer (University of Utah), Michael Sedlmair (University of Vienna), P. Samuel Quinan (University of Utah), and Tamara Munzner was published online in the Journal of Information Visualization, and will appear in a forthcoming special issue on evaluation (BELIV). by Michael Sedlmair (University of Vienna), Tamara Munzner, and Melanie Tory (University of Victoria) was presented at IEEE InfoVis 2013 in Atlanta, USA. by Matthew Brehmer and Tamara Munzner was presented at IEEE InfoVis 2013 in Atlanta, USA. by Joel A. Ferstay, Cydney B. Nielsen (British Columbia Cancer Agency), and Tamara Munzner was presented at IEEE InfoVis 2013 in Atlanta, USA. Tamara Munzner participated in the panel discussion How Much Evaluation Is Enough? at IEEE InfoVis 2013 in Atlanta, USA. Jessica Dawson presented her MSc thesis. Tamara Munzner gave an invited talk at Graph Drawing 2013 in Bordeaux, France. Stephen Ingram successfully defended his PhD dissertation. Joel Ferstay presented his MSc thesis. 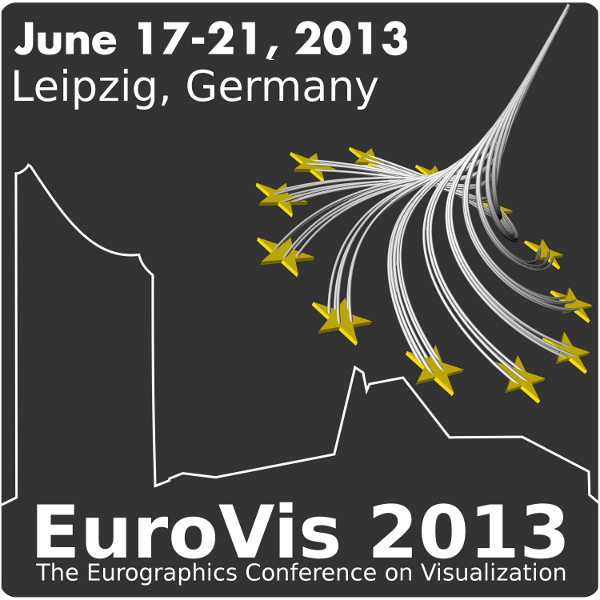 Tamara Munzner gave an invited talk at the EuroVis 2013 Workshop on Visual Analytics for Multidimensional Projections on June 19th in Leipzig, Germany. by Stephen Ingram and Tamara Munzner was presented at SIGRAD 2012 in Växjö, Sweden. Design Study Methodology: Reflections from the Trenches and the Stacks. by Michael Sedlmair, Miriah Meyer (University of Utah), and Tamara Munzner was presented at IEEE InfoVis 2012 in Seattle, USA. RelEx: Visualization for Actively Changing Overlay Network Specifications. by Michael Sedlmair, Annika Frank (Bertrand AG), Tamara Munzner, and Andreas Butz (University of Munich) was presented at IEEE InfoVis 2012 in Seattle, USA. Grassroots Reproducability: Just Do It! Tamara Munzner participated in the panel discussion Reproducible Visualization Research: How Do We Get There? at IEEE InfoVis 2012 in Seattle, USA. by Miriah Meyer (University of Utah), Michael Sedlmair, and Tamara Munzner was presented at the ACM Workshop on BEyond time and errors: novel evaLuation methods for Information Visualization (BELIV) in Seattle, USA. Vismon: Facilitating Analysis of Trade-Offs, Uncertainty, and Sensitivity In Fisheries Management Decision Making. by Maryam Booshehrian (Simon Fraser University), Torsten Möller (Simon Fraser University), Randall Peterman (Simon Fraser University), and Tamara Munzner was presented at at EuroVis 2012 in Vienna, Austria, and was awarded the Second Best Paper Award. 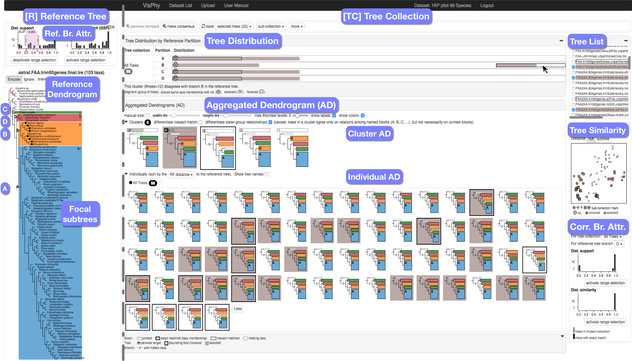 A Taxonomy of Visual Cluster Separation Factors. by Michael Sedlmair, Andrada Tatu (University of Konstanz), Tamara Munzner, and Melanie Tory (University of Victoria) was presented at EuroVis 2012 in Vienna, Austria. by Tamara Munzner was presented at the SPIE-IS&T Human Vision and Electronic Imaging 2011 Conference in San Fransisco, USA. by Tamara Munzner, Aaron Barsky, and Matt Williams appeared in Scientific Visualization: Interactions, Features, Metaphors. Dagstuhl Follow-Ups 2.